Why is timing so important when it comes to treating a cavity? The threat posed by tooth decay is serious – if nothing is done in time, you could lose your tooth, and you could have an infection spread from the original problem tooth to your jawbone, and neighboring teeth. Prompt restorative dental care can ensure that the damage you experience is minimized, meaning a smaller restoration, and no complications. How can you make sure you have access to the right treatment as soon as possible? Your dentist can actually identify a cavity at an early stage of its formation when you go in for a routine appointment. 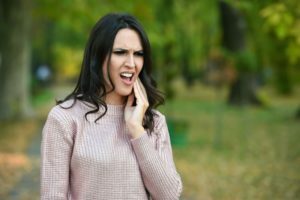 This can help ensure that you only need a dental filling after your treatment, and it can mean escaping the need for treatment in the form of a root canal procedure. Regular dental exams give your dentist a chance to review your smile’s condition, identify problems, and recommend early treatment, before matters grow worse. They also mean giving you access to a thorough cleaning, which can reduce your risk for problems. Patients who regularly see their dentist for an exam and cleaning will be less likely to deal with tooth decay, as well as gum disease. What can you do to make sure you will not need restorative dental work any time soon? Your trips to the dentist’s office are important, but there are also important steps to take on your own time. You need to take at least two minutes to care for your teeth whenever you brush, and work to clean every area of them. You should also floss each day, to make sure those spaces between teeth are enjoying valuable support. Patients who want great dental care can count on it every time they visit Wager-Evans Dental! Our practice is proud to offer comprehensive oral health support to patients of all ages. Located in Reno, NV, we proudly welcome residents from South Meadows, Double Diamond, Caughlin Ranch, Donner Springs, Meadowood, Sommersett, Arrow Creek, and all surrounding areas. To learn more, or to schedule a consultation, contact us today by calling (775) 829-7700.